The Indiana Clinical and Translational Sciences Institute (CTSI) has opened a new RFA for funding to use a new research tool from the Indiana Biosciences Research Institute (IBRI) and MavenSphere Inc. called DigiBiomarkers. 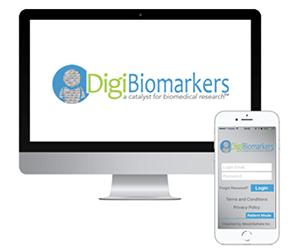 DigiBiomarkers is a HIPAA-compliant, cloud-based mobile and web application platform for researchers that aims to collect real-time, continuous and objective digital data from study participants. The platform provides a user-friendly clinical study management tool kit that researchers can use to customize their studies. DigiBiomarkers also automates a traditionally time-consuming process—for both researchers and study participants—of pen-and-paper surveys and phone call reminders, in addition to enabling the capture of data about study participants’ activities and environment (if consented) from connected devices. Cian O’Donnell, MS, a digital consultant at the IBRI, said DigiBiomarkers allows researchers to add more objectivity to subjective measures in their studies, especially where measurements may not be available. Duration of access to the DigiBiomarkers platform will be negotiable depending on the defined research projects and their goals. Before submitting an application, those interested are encouraged to contact O’Donnell at codonnell@indianabiosciences.org or Bharath Bynagari at bynagari@mavensphere.com to pre-qualify and arrange a personalized demo of the DigiBiomarkers platform. Want to learn more? Download the DigiBiomarkers information pamphlet.